If you have a pet cat or dog, or you are thinking of adopting, one of the most important decisions you need to make for their health, safety and happiness, and for your local community, is to get your pet spayed or neutered. So, what does it involve? Neutering is the removal of the testicles (castration) of your male pet and spaying is the removal of the ovaries and uterus of the female. It is a minimally invasive veterinary procedure that offers lifelong health benefits. As well as performing the operation using keyhole surgery for the females (the male castration is minimal incision anyway) whilst under the general anaesthetic, the animals are given an injection of antibiotics, anti-inflammatories and pain relief so the owners will not have to administer any medication after the surgery. Every year in Spain, thousands of cats and dogs of all ages and breeds are euthanised or suffer unnecessarily on the street as strays. This high level of unplanned litters could be avoided by owners taking responsibility for their pets and getting them spayed or neutered. Spaying your female pets can help prevent uterine infections, uterine cancer and mammary tumours, diseases which are fatal for around 50 percent of dogs and 90 percent of cats. Ideally you should spay your pet before her first heat, but don’t be deterred if this is not possible. Better late then never! Neutering males prevents testicular cancer, if done before six months of age. Although cycles vary, during breeding season, female cats usually go into heat for 4/5 days every three weeks. During this time you will notice that they will yowl and urinate more frequently, indoors and outdoors, to attract a mate. Spayed dogs are less likely to have hormone related behavioural problems. A male dog, or cat, that has not been neutered will go to great lengths to find a female in heat and an escaped dog poses a risk to himself and other males in the area. Neutered cats and dogs focus their attention on their human families. On the other hand, un-neutered dogs and cats may mark their territory by spraying strong-smelling urine throughout the house. Many aggression problems can be avoided by early neutering. And don’t worry, your dog will still be protective of his home and family. 6. Spaying or neutering will NOT make your pet fat. This is not a good reason to decide against spaying and neutering. Lack of exercise and overfeeding will lead to weight gain and health issues and it is the job of a responsible pet owner to continue to provide exercise and ensure a regular diet. 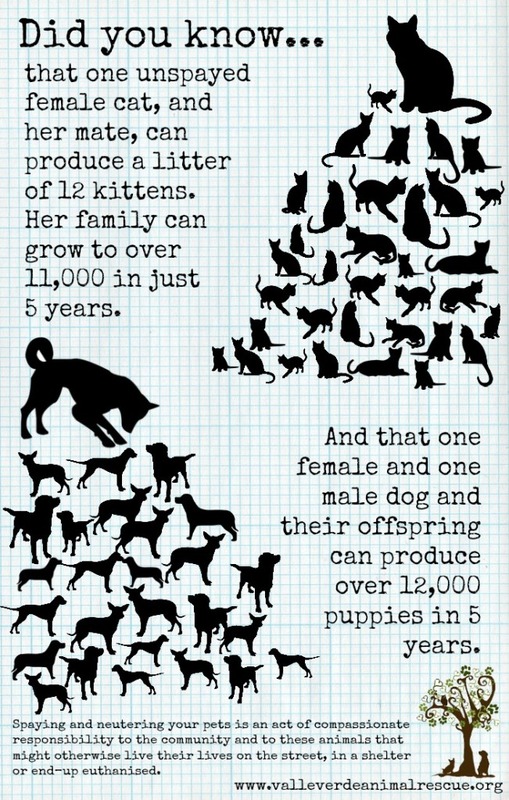 The cost of your pet’s spay/neuter surgery is a lot less than the cost of having and caring for a litter. And in the long run is cheaper than vet’s bills for treatments of avoidable diseases mentioned above and treating your male pets if they manage to escape and get into fights with other animals. There is a monthly low-cost spay and neuter programme in Granada for cats and dogs. For more details about the next Spay & Neuter Day contact Sue Halfyard using the form below.